We're all being encouraged to use two-factor authentication to make our online accounts more secure. But 2FA can be a major pain when you update to a new device and have to re-authenticate everything. Even when users save their private 2FA keys to migrate onto new devices, it can still take time to manually reset 2FA for each account. 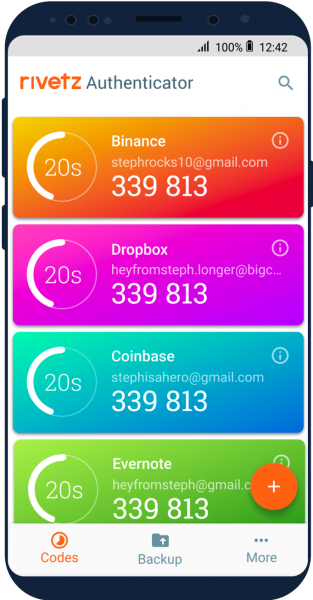 Now though specialist in Mobile cybersecurity Rivetz is launching a new Authenticator app that offers backup and recovery of 2FA keys using mobile devices' existing hardware security capabilities. In a Rivetz-commissioned survey of 1,000 US adults, 49 percent of respondents say they had lost access to their accounts because they were unable to access their 2FA recovery keys. Rivetz Authenticator also features a Trusted User Interface (TUI) for supported devices -- which include Samsung mobile phones running Android 8 and above. The TUI allows device owners to verify actions with the assurance that malware cannot possibly infect a transaction, ensuring that the action taken by the app was the user’s intended action. Authenticator also is designed to support validation of external controls, such as geolocation or biometrics, enabling additional security and compliance capabilities. "2FA is a powerful cybersecurity method, but when you get a new phone you are locked out until you navigate a labyrinth of security procedures for each app or account," says Steven Sprague, CEO of Rivetz. "Authenticator provides a secure and simple one-step method to maintain robust 2FA cybersecurity across all your accounts and devices. Cybersecurity should be grandma-simple -- it should just work. We designed The Rivetz Network and Authenticator from the ground up to liberate the modern subscriber from the antiquated username/password paradigm." You can find out more on the Rivetz website and you'll find a video explaining how Authenticator works and an infographic of the survey findings below.